A new commercial block close to the River Thames has been redesigned as a steel structure that will sit above any potential flood waters. 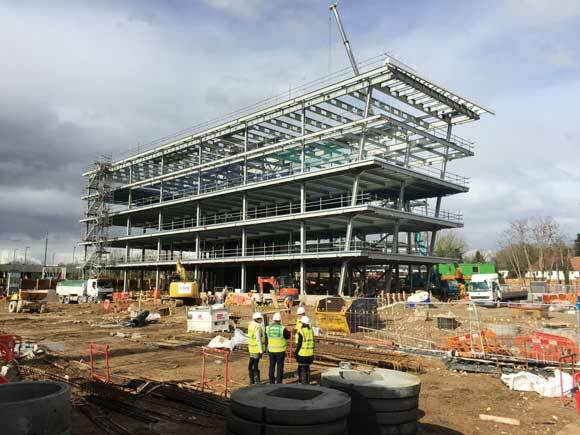 Steel tonnage: 1,100tLocated at Egham in Surrey, close to the River Thames, the redevelopment of Tamesis One involves the construction of a new five-storey office block to replace a previously demolished building. Client Royal London Asset Management has pre-let the offices to technology research company Gartner, who also occupy the adjacent Tamesis Two building. The scheme also includes the construction of a dedicated four-storey steel-framed car park to the rear and new landscaping throughout. Initial designs considered both concrete and steel-framed options. Main contractor BAM opted to go with the steel solution as it offered a quicker programme. A cost saving was also gained as shallower foundations were required, while more slender columns were attainable with steel giving the project a more aesthetic look. “The top floor was always going to be built with steel because it has 15m-long spans, however we redesigned the entire scheme as a steel structure during Stage 3,” explains Heyne Tillett Steel Project Engineer Szymon Lukas. The site has historic flooding issues as it is close to the River Thames. This was a key consideration in the design of the new development. A comprehensive sustainable urban drainage system has been incorporated in the works. Supported on up to 25m-deep CFA piles, the steel-framed office building has been raised above the flood plain to create a 800mm void under the building that could be used, in the event of a deluge, as a flood water reservoir. The flood zone void has been created with a suspended ground floor structure comprising a beam and block floor system spanning between RC beams. Steel columns are sat directly on the pile caps and are encased in concrete below ground floor level. The encasement was introduced to protect columns from corrosion and to provide structural bearing for the RC beams. Space is at a premium on this confined site and so logistics have played an important role in the construction process. As the two structures take up most of the site, leaving little room for material storage or plant equipment, a phased sequence was adopted with the office block erected first. Once this was up and the envelope nearly complete, the adjacent steel-framed car park was erected. The five-storey structure will provide 11,600m² of office space and measures approximately 60m × 50m. It is a composite steel frame with in situ concrete slabs cast on profiled metal decking. Steelwork contractor H Young Structures erected the 800t of structural steelwork for the office building as well as installing metal decking, stairs and lift shafts in an 11-week programme. “We erected the structure in a multi-phased sequence as it had to be handed over at various stages to allow follow-on trades to get started to keep the overall programme on schedule,” says H Young Structures Managing Director Ian Peachment. The structure is generally on a 7.5m × 9m grid except for the uppermost floor where internal columns have been omitted to create a large open-plan area with 15m clear spans. “The idea was to create a statement for the top floor as it also benefits from having good views over the surrounding countryside,” explains Mr Lukas. Internally a full-height atrium splits the building in half. Topped with glazed rooflights the atrium allows natural light to penetrate the inner parts of the building and also accommodates the main reception areas and entrance. 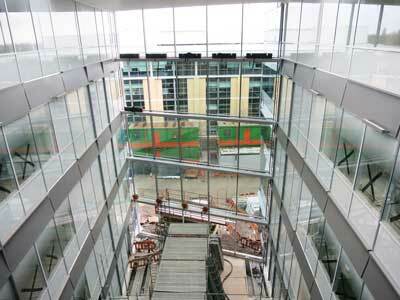 Steel link bridges on each floor span across the 12m-wide central atrium providing access between the two sides of the building. Structurally, the entire building is one large braced frame deriving all of its stability from strategically positioned bracing. Westok fabricated beams with large web openings have been used at roof level to provide flexible services distribution within the depth of the structural roof zone. Externally, the offices feature a series of perimeter cantilevers of 1.5m, with a larger 3m cantilever to the front façade. As well as helping to increase the available floorspace, the cantilevers provide a stand-out architectural feature to the building. The larger 3m-deep cantilever is located on a raking façade which occupies half of the building’s main eastern elevation. Adjacent to the main entrance, the raking columns slope outwards by 10 degrees to the rest of the frame and had to be temporarily propped until the floors were cast, which then gave them the necessary stability. Adjacent to the raking elevation the building also features an angled façade which cuts in on plan to form the entrance. The exterior of this angled zone is topped by a brise-soleil at roof level formed with 400mm × 200mm × 10mm RHS sections, which cantilever out from the main frame by up to 7m. 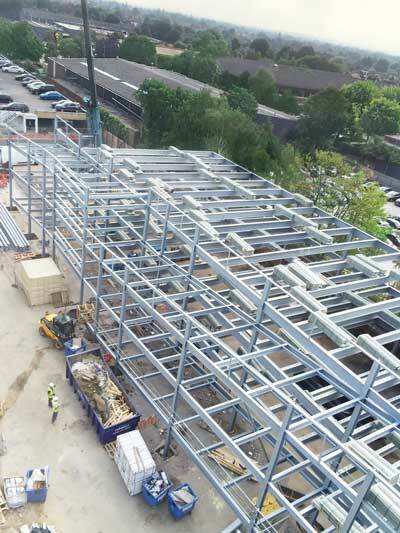 Steelwork for the stand-alone car park was completed by H Young in a separate six-week programme and required the erection of 300t of fully galvanized steel. The four level car park measures 80m long × 21m wide, including exterior ramps, and provides 240 parking spaces. There are no internal columns, which creates 16m clear spans for maximum flexibility. 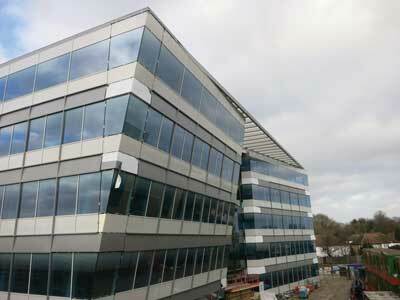 The project’s construction programme has recently completed and it is expected to achieve a BREEAM “Very Good’ rating. “We‘ve recently been awarded the fit-out programme for the offices which means our hand-over date has been extended to August,” sums up Mr Rabey.